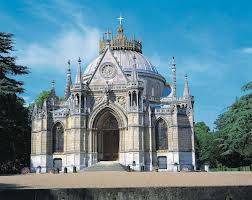 Built in 1816, on the site of the ancient fortress of the Counts of Dreux, the chapel Saint-Louis of Dreux was the burial place of the Bourbon-Orléans family. From 1830, the chapel Saint-Louis of Dreux became the burial ground for the Maison de France. The recumbent figures for King Louis-Philippe's family were ordered from the most famous names in funerary sculpture of the 19th century. The Sèvres manufactory produced some outstanding painted and enamelled stainded-glass windows inspired by religious and historica compositions, such as "the life of Saint6louis", patron saint of the chapel Saint-Louis.